PCSK9 ELISA Kit | Cell Biolabs, Inc.
Proprotein convertase subtilisin kexin 9 (PCSK9), also named neural apoptosis-regulated convertase 1 (NARC-1), is a member of the proteinase K subfamily of subtilisin-related serine endoproteases. PCSK9 has profound effects on plasma low-density lipoprotein (LDL)-cholesterol (LDL-C) levels through its ability to mediate LDL receptor (LDLR) protein degradation, its primary function. Cell Biolabs’ Human PCSK9 ELISA Kit is an enzyme immunoassay developed for the detection and quantitation of human PCSK9 in plasma, serum, cell or tissue lysate samples. Each kit provides sufficient reagents to perform up to 96 assays including standard curve and unknown samples. Figure 1: PCSK9-Mediated Degradation of the LDL Receptor. A: Schematic of the major domains of PCSK9. 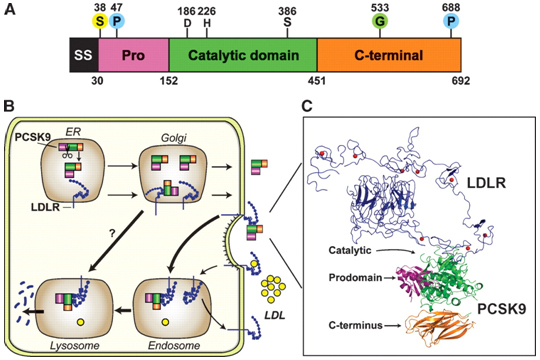 B: Cellular trafficking and potential sites of PCSK9 action. C: Model for full-length LDLR bound to PCSK9. 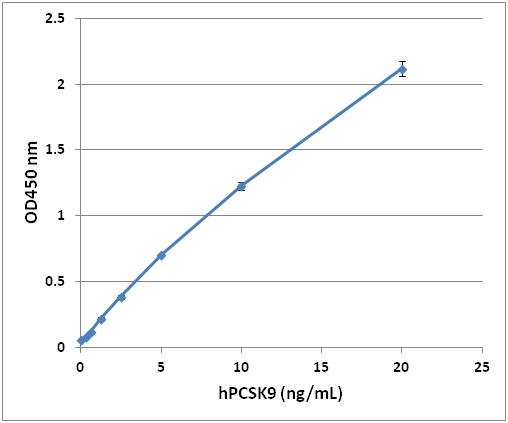 Figure 2: Human PCSK9 ELISA Standard Curve. Franzén, O. et al. (2016). Cardiometabolic risk loci share downstream cis-and trans-gene regulation across tissues and diseases. Science. 353:827-830. Nekaies, Y. et al. (2015). Plasma proprotein convertase subtilisin/kexin type 9 is associated with Lp (a) in type 2 diabetic patients. J Diabetes Complicat. doi:10.1016/j.jdiacomp.2015.08.003. Jin, K. et al. (2014). Plasma PCSK9 in nephrotic syndrome and in peritoneal dialysis: a cross-sectional study. Am J Kidney Dis. 63:584-589.